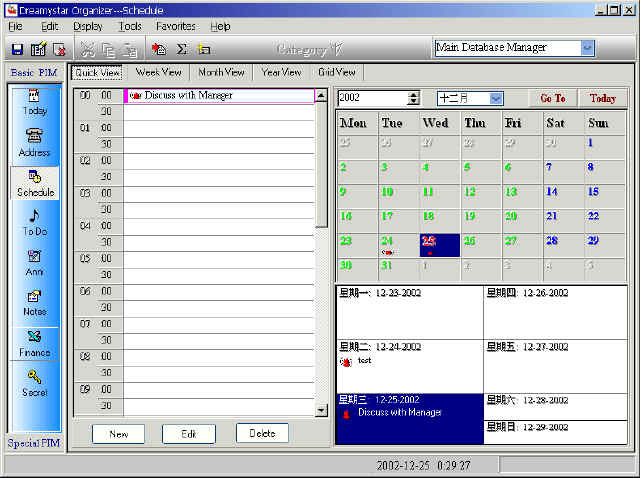 Dreamystar Organizer is an All-In-One powerful Home Professional Organizer, Business Organizer Software specialize in Personal and workgroup information manage. It can manage all your Personal information and add-on ephoto,ebook easily and securely. With the record locking mechanism, workgroup members can share data effectively and conveniently. can also be used to share workgroup or small business member's personal information through Local Area Network(LAN) environment. Dreamystar Organizer lets you Manage Personal informations such as Address Book (Organizes address information and contact information) , Schedule (Organizes schedule with a real-time alarm reminder in day,week,month and year view.) , Notes(Organizes your daily things).Anniversary (Organizes anniversary and festival with alarm reminder support.). e-Book (Organizes e-book in tree structure,a nice book reader. ), Infotree (Category organizes all your disk file's link with intuitive tree structure. ), e-Photo (Organizes e-Photo with powerful picture operation,a super photo album.). Finance (Organizes Expense and Income). 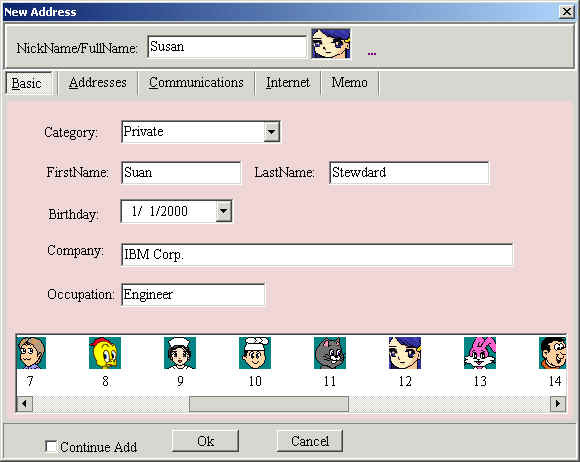 My Secrets (Organizes Secret data,contains bank account,credit card info,email,icq etc). Data Category,Data Password Protection -- Unlimited categories supported, password set can protect all data. Report Print&Design -- User can Print records by predefined format and can design your own report format. Predefined world time zones -- There are 140 world cities time zone predefined for display in today function! Predefined Country festivals--There are 1400 festevals for you to select into anniversary function. Word merge mail and Multiple mail send --- your address book can be acted as word merge data source. Real-time Reminder Monitor -- Reminder monitor can monitor all your schdule,to do,anniversary changes. Ephoto function support a rich bundle of picture format --about 22 types of picture format supported by ePhoto. Powerful eBook function--- More than 15 deepth levels and every level 999 items supported in ebook. Super Address Book Collaboration -- address book can collaborate with word, outlook, email client programs. Secure and flexible data manage -- All data are encrypted before saved to disk, workgroup database directory, can be reset to create more workgroups or cooperate with other dreamystar organizer workgroups within your LAN network. Built-in Multi-Tab Web Browser ---Enable you Surf multiple web sites at the same time without leave program.